Next to another Gemini comes the action; you start with projects and modernizations. Your relationship is fully stimulated and your ideas turn into actions. You both are impulsive and the rhythm is alert. Gemini woman loves presents and surprises and has a big flaw: that of laughing in the most inappropriate moments. Should this happen on a date, laugh with her! As an advertisement, once you get used to having a Gemini around you, you become addicted to her! But she must never know that. Due to her developed sense of humor she will be forgiven a lot of things. You should keep in mind that Gemini natives do not like being restricted or tied down. The more independent you look, the more she will depend on you. When it comes to infidelity, Gemini natives have a big mouth but never act. Should you try to make a Gemini jealous he will revolt and you will lose him if you are possessive. Let him enjoy his independence and he'll happily come home. 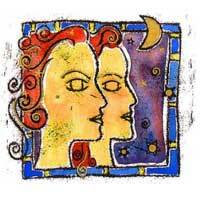 Gemini is flexible, agile, charming and energetic, always on the move and willing to satisfy his own curiosity. He can be tiresome, and if you prove it to him, he will agree but in fact he will expect you to keep up with him. Hang on to him tightly but be subtle.